The best of the best of the best optics, Sir. If I could have my pick from the magic bag of glass carried by the Optics Fairy, I’d have to pick ELCAN. No question. These guys are the Swarovskis of fighting optical gunsights. 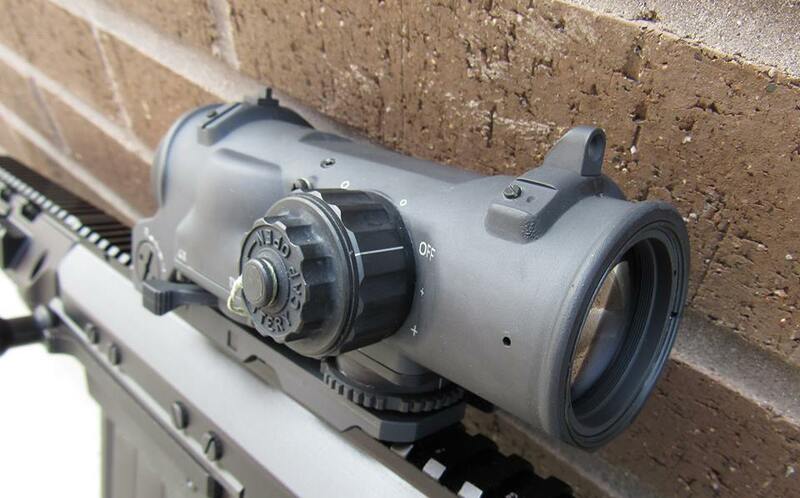 Super clear, super bright… Everything you want in a high quality scope, all wrapped up in a super strong Combat Optic. Wide field of view with no distortion. Longer eye relief than competitors… wider eye box. 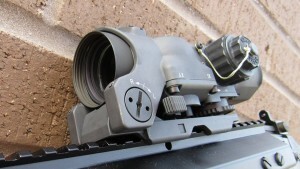 And a reticle that allows for extreme shooting precision. It really doesn’t get any better than this. This version has a simple 1x to 4x switch. Zoom, or No Zoom. So the mechanism is very sturdy. So much so it makes a Leupold seem fragile. One of the reasons it’s so strong is that the elevation and windage adjustments are outside of the tube, and internal like most scopes…. Even the mighty Trijicon ACOG. Illumination is a big fat dial that fast and easy to use. 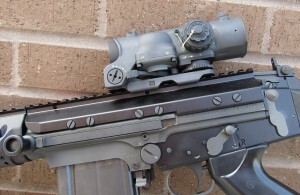 And you can see there, it’s got a set of iron sights on top. 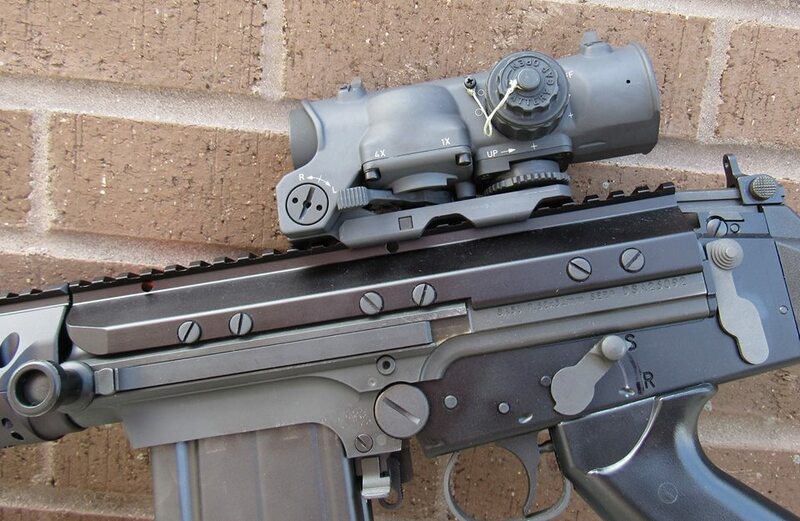 This is probably the finest magnified combat optic you can get. Elcan offers a bunch of variants 1-4, 1-6, yada yada yada all good… all awesome. There’s even a 5-20 coming out – but you gotta be Delta Mega Force to get it right now. The only downside to these optics – is price. They are expensive. By expensive, I mean they are the cost of a couple really decent AR-15 rifles. But there really and truly is nothing better to put on top of your AR-15 rifle. But is it worth it? If you can afford it, absolutely. One thing I’ve learned… good optics are a force multiplier. They can make or break your success in the field. I’ve seen it hunting… I’ve seen it in force on force operations. If you can see your adversary before he sees you, you win. If you can aim precisely at a target you can see clearly, ID that target and place your shot, you win. Good glass is critical. I’ve tried to use cheap class. 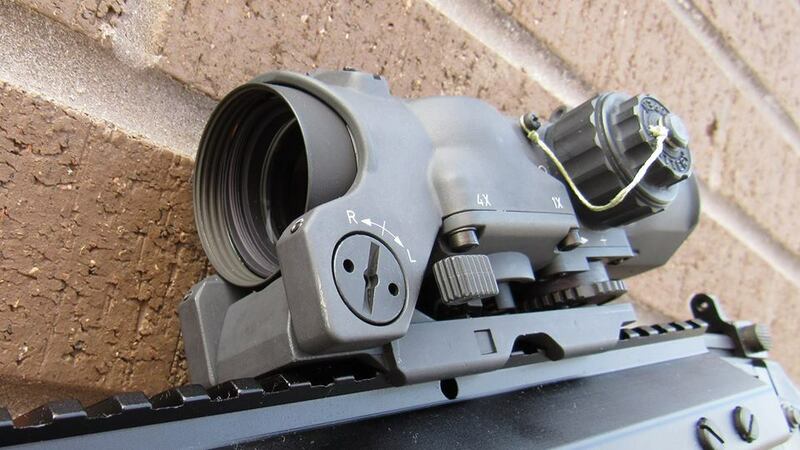 I can see the target with naked eyes or with my binos – but can’t see the target in the scope. It’s happened. I’ve also seen great glass in the field and on the range go belly up because the scope just wasn’t strong enough to handle the mission. (Swarovski Optics) ELCAN has the optical quality and the strength. Seriously, this is business right here. Nothing’s better. If you can afford it. Great post. Thanks. I’ve always considered Kahles the top in optical quality. I have only one of their scopes and it is a hunting model 2-7×36 with German #4. Breath taking clarity. Their new tactical line seems very impressive, but this “switch” power ELCAN seems even better. Truth is most of us never use the intermediate power of most variables. We either turn them all the way down or all the way up. There are exceptions, but that seems to be the norm, except in high power target scopes where you are trying to tune out mirage. I may try to save up some nickels (will take some time at those prices) to pick up an ELCAN. P.S. I’d love to know what forearm that is on that FAL. Wasn’t this the Canadian Government scope of choice years back? How did they work in real service? I know there are some Canadian Soldiers out there. I was pre-optic in the 1970’s. I’m putting a Lucid HD-7 on my AR this weekend. Working with the wife and long arms next week. Yes, Canadian military used them first. Lucid… 200 bucks. Elcan 2200 bucks. Both awesome in their own rights. What ever happened to the insight ISM-V? Does anybody have any expexperience with it? I think it was discontinued.